Desiring some fresh food during the non growing months, after some trials lentils were chosen for sprouting. They are reliable sprouts, economic and readily available. I keep two batches going and utilize almost every day. They are blended with my various pressure canned juices as required. They readily sprout at room temperature so can be grown in most environments. Accompanying pictures depict processing and preparing for sprouting. 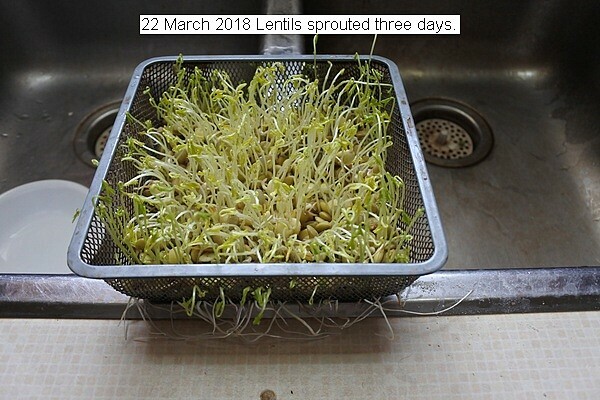 This entry was posted in Uncategorized and tagged 22 March 2018 Lentils, Lentils sprouting. Bookmark the permalink.